$50.00 per month. must Pre-Register every month. 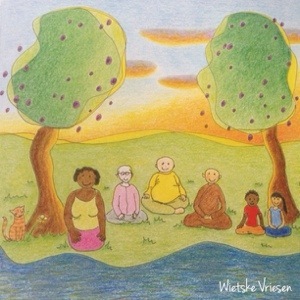 Email: peacefulgestureyoga@gmail.com . Tween pj, yoga & pizza Party at Charlotte Family Yoga center. Ages 8-12 cost: $20.00 May 17 6-8pm. Summer Camp Tumbleweeds. 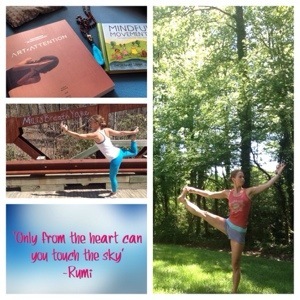 Creative movement based camp incorporating yoga, art, writing and gardening. Week long sessions June 16-20 & July 14-18 9 a.m.-1p.m. Cost $250.00 per kid. Register by June 2 and save $50! Register a sibling for only $175.00. I am so excited and honored to be teaching the summer camp sessions at Okra this summer. 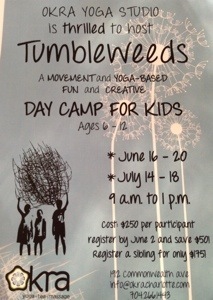 This is a creative movement based camp incorporating yoga, creativity, gardening and growth for kids ages 6-12. Highlights from the Rising Appalachia show. I saw these girls perform last night at the Visualite in Charlotte. They rocked out in a gospel meets bluegrass meets raps meets talent on the stage. These two sisters were a hit. If you haven’t heard of them check them out. Here’s a video clip of a highlighted moment for me while down by the stage. It’s the subtle things in life. Beauty and Bounty. We are meant to be happy beings living on planet earth. It’s the subtle things in life. The ones that make me take a look around and see where I’ve landed. Music fine tunes each of those moments into bliss.